The U.S. Department of Agriculture’s (USDA) Food Safety and Inspection Service (FSIS) is issuing food safety recommendations for those who may be impacted by Hurricane Matthew. Photo by: Tim & Annette, via Free Images. Washington, DC - October 5, 2016 - The U.S. Department of Agriculture’s (USDA) Food Safety and Inspection Service (FSIS) is issuing food safety recommendations for those who may be impacted by Hurricane Matthew. The National Hurricane Center expects the Category 3 hurricane will affect Florida’s Atlantic coast Thursday evening and Friday. Based on latest forecast models, Matthew is also likely to impact the Eastern United States as it moves up the East Coast this weekend. Significant flooding is possible from Georgia through Massachusetts, including South Carolina, North Carolina, Virginia, Washington, D.C., Maryland, New Jersey, New York, and Connecticut. According to the National Hurricane Center, some slight strengthening is forecast during the next couple of days. Hurricanes present the possibility of power outages and flooding that can compromise the safety of stored food. Residents in the path of this storm should pay close attention to the forecast through the week. Be aware that flooding from heavy rain, damaging winds, and storm surge is possible. Freeze water in one-quart plastic storage bags or small containers prior to a storm. These containers are small enough to fit around the food in the refrigerator and freezer to help keep food cold. Remember, water expands when it freezes so don’t overfill the containers. Do not eat any food that may have come into contact with flood water – this would include raw fruits and vegetables, cartons of milk or eggs. Discard any food that is not in a waterproof container if there is any chance that it has come into contact with flood water. Food containers that are not waterproof include those packaged in plastic wrap or cardboard, or those with screw‐caps, snap lids, pull tops, and crimped caps. Flood waters can enter into any of these containers and contaminate the food inside. Also, discard cardboard juice/milk/baby formula boxes and home canned foods if they have come in contact with flood water, because they cannot be effectively cleaned and sanitized. Inspect canned foods and discard any food in damaged cans. Can damage is shown by swelling, leakage, punctures, holes, fractures, extensive deep rusting, or crushing/denting severe enough to prevent normal stacking or opening with a manual, wheel‐type can opener. FSIS will provide relevant food safety information as the storm progresses on Twitter @USDAFoodSafety and Facebook. 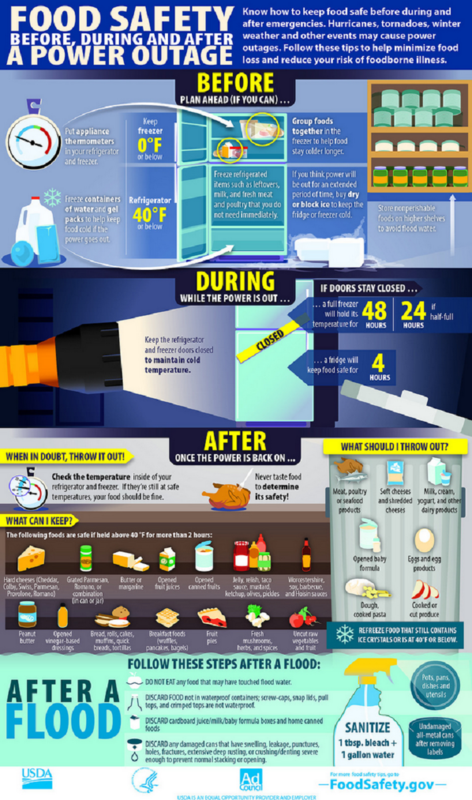 FSIS’ YouTube video “Food Safety During Power Outages” has instructions for keeping frozen and refrigerated food safe. The publication “A Consumer’s Guide to Food Safety: Severe Storms and Hurricanes” can be downloaded and printed for reference during a power outage. FSIS also has an infographic covering what to do before, during and after a power outage. If you have questions about food safety during severe weather, or any other food safety topics, can call the USDA Meat & Poultry Hotline at 1-888MPHotline or chat live with a food safety specialist at AskKaren.gov. These services are available from 10:00 a.m. to 4:00 p.m. Eastern Time, Monday through Friday, in English and Spanish. Answers to frequently asked question can also be found 24/7 at AskKaren.gov. Subject: LongIsland.com - Your Name sent you Article details of "USDA Food Safety Tips for Areas Affected by Hurricane Matthew"